First Light Technologies is pleased to offer our customers PTFE (Polytetrafluoroethylene) Encapsulation. This value-add enhancement option may be included on most UV lamps manufactured by First Light Technologies, Inc. 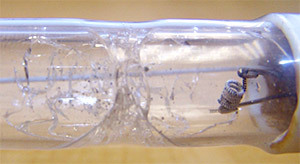 The addition of a thin layer of UV transmittable PTFE (.25mm) encases the full length of the lamp, including connectors, using a special heat process. After the process, the PTFE encapsulated lamp, can be used in the same equipment where a non-encapsulated lamp once sat. If the lamp is broken during installation, equipment operation or re-lamping, the components of the lamp are fully contained and the purity of the environment is not contaminated. PTFE sleeves used by First Light Technologies, Inc. are made from pure virgin PTFE with no fillers or additives and therefore offer exceptional properties of PTFE. The major characteristic is a upper continuous working temperature of 260°C and superior resistance to UV radiation and virtually all chemicals. The UV resistance of the PTFE makes it an ideal containment material for UV Lamps as it will allow the UV radiation to permeate the PTFE without weakening or deterioration. Applications where PTFE encapsulation will be a welcome and cost effective enhancement include Food, Beverage, Pharmaceutical, Semi-conductor Fabrication and other applications that are ultra-sensitive to introduction of foreign and hazardous material. All components are contained if the lamp is broken, falls out of the fixture or is damaged in anyway making it a perfect enhancement when designing equipment for offering replacement lamps. Reduces downtime and cleanup in the event of a broken or damaged lamp. Reduces the need for more costly safeguards. Reduces the Hazardous Material issues in the event of a lamp breakage. Contact First Light Technologies, Inc. for additional information and a sample UV Lamp with PTFE encapsulation.